With two dropped fly balls ruled "no catch" via replay review on Tuesday night, now might be a good time to review the criteria of the air putout more commonly known as a catch. A catch is addressed in two different 'official' documents: The Official Baseball Rules and the Major League Baseball Umpire Manual (MLBUM). F8 Mookie Betts goes over the short wall. Rule 2.00 [Catch] (2015 OBR Appendix Definition of the term, 'Catch') defines a catch as: "The act of a fielder in getting secure possession in his hand or glove of a ball in flight and firmly holding it...In establishing the validity of the catch, the fielder shall hold the ball long enough to prove that he has complete control of the ball and that his release of the ball is voluntary and intentional. If the fielder has made the catch and drops the ball while in the act of making a throw following the catch, the ball shall be adjudged to have been caught." In other words, as the MLBUM interprets it, "A ball will be ruled caught when the momentum of the catch is completed and the player voluntarily releases the ball." The first such play Tuesday evening occurred in Cleveland, when Royals batter Lorenzo Cain hit a fly ball to deep right field. As Indians RF Brandon Moss attempted to corral Cain's fly, he ran into the outfield wall and, in doing so, dropped the baseball. Replays indicate that F9 Moss indeed gained possession of the baseball in his glove, but failed to satisfy the requirement that his release must be voluntary and intentional. The more complex of the two plays occurred in Boston on White Sox batter Jose Abreu's long fly ball to right-center field, where Red Sox CF Mookie Betts attempted to catch the sinking fly. Replays indicate that after capturing the ball in his glove, Betts' momentum took him up over the wall and into the Fenway Park bullpen, whereupon the ball popped out of his glove. 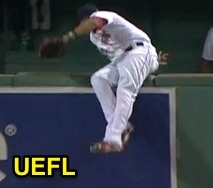 In addition to an involuntary release, Betts' effort was not ruled a catch by the New York Replay Official because, pursuant to the MLBUM interpretation, his momentum was not completed with the ball still in his control. As Rule 6.09 (OBR 2015 Rule 5.05(a)(9)) states, a four-base award (home run) shall be granted if "any fair fly ball is deflected by the fielder into the stands [in fair territory]." If deflected into foul territory, the award is second base. Had there been less than two outs on this play and Betts was ruled to have legally caught the ball before carrying it out of play, any existing runners would be awarded one base (and B1 would be declared out). Easter Egg: Watch Bullpen Cop, Boston Police Officer Steve Horgan, do his thing at 3:48. As for the more intricate and complex issue of a ball dropped on the transfer after having been legally caught vs. a ball bobbled and never caught, refer to MLB's May 2014 interpretation of the Catch/Transfer rules.